J.C. RICARD Inc. is an import company specialized in wholesale Canada souvenirs & gifts. Established in Quebec City, Canada since 1942, we offer the largest online selection of customised Canadian souvenirs. Come in and view our vast selection of model boats, lighthouse replicas, and other nautical souvenirs. We are the ones who introduced the now famous Quebec winter carnival horn, great for festivals and sporting events, meetings, political rallies, fundraising campaigns, shows and other special events. We create custom souvenirs with your logo and offer wholesale prices. Contact us for more information. View our catalog or visit our products section. Enjoy your visit into Canada's biggest online gift and souvenir store! 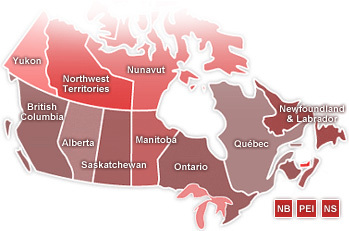 Click on the province of your choice to see the available products for this province. We are still working on this section. Please note that ALL items in this web site can be customised. Contact us for more details! Why buy from J.C. Ricard Inc.? Are the prices shown are the wholesale or retail prices?